31 years ago a shy French boy is ready to dive to catch a coin in the port of Amorgos when a two years older tough Italian with myopic glasses, bass voice and bossy look dives in his place and with one breath he earns the coin, the challenge, the admiration, the winner, as said, takes it all. The story of the film takes place in 1968 – a significiant year with important facts and overturns all around the world, May ’68 among them. 20 years after the tough boy returns with the deeper voice of Jean Reno, ready for another challenge : to compete for the world title in free diving against his old friend. This is life and cinema history as the real two divers were -with some changes- the heros of The Big Blue. Enzo Maiorca in life- Molinari as a child in the film of Luc Besson- was played at the age of 11 by Gregory Forstner. Half Austrian half French, well known artist, who also writes and as an amateur dives, a citizen of the world who only feels at home by the sea, Gregory Forstner returns to the place and the years of innocence in Amorgos on the occasion of first international tournament of free diving which will take place 18-24 of September 2017 in Amorgos where was filmed the Big Blue. It is said that water has memory. Gregory Forstner admits feeling happy only by the sea but not only to remember. A dive in the past. In the dephts of the sea, but even more in memory… With us he talks about life experience, projects and some ghosts. E.F: Flash back 30 years ago, you are 11, what are your memories ? G.F: I was a kid, I couldn’t realize the luck I had, but nevertheless I enjoyed and remember everything of my trip and experience to Amorgos, also the Island of Ios, and of course my encounter with Luc Besson, Jacques Mayol, Jean Reno together with all the cast. Luc Besson was very kind, he was 28 years old at the time, it’s amazing when you think of it, he knew what he wanted, had the courage of his emotions, of his esthetics. He made it very easy for me to do what I had to do, I felt very comfortable with him, he was playful, accessible and professional in the same time. I wrote a bit about my experience in “L’Odeur de la Viande” published 2 years ago (“The Smell of Meat”). Amorgos was a very simple, raw (in a good way!) Island – so it felt – and outside the main tourism. I don’t remember real Hotel as such. Most of my time, we were waiting for the right weather to be able to shoot. That’s the first thing I learned as an actor: most of the time, you have to kill time! And killing time for me wasn’t a problem in such an environment. I rented a small motorbike, and I remember riding it all over the island, up and down, again and again, all day long, with complete freedom while being really unconscious too, no helmet on my head, in shorts, etc. The landscape was in front of me, under me, everywhere, I felt like riding the moon. E.F: What took you so long to return to Amorgos? G.F: I guess I needed a real purpose. I was born in Cameroon, and never went back yet either. For places that really counts, especially when it comes to childhood, I guess we need some extra reason to get back. It just had to make sense so that it is not just anecdotical. When reality catches up with the past, it has also to bring something new/different in order for us to relate to it with today otherwise we are left to compare it to our memory (which is always failing). It has to be in the frame of a new experience. E.F: “It is better down there, it is a better place…”said the hero Jacques Mayol in the film, what place is down there in your eyes? G.F: My father taught me to dive at a very young age. One of the most intimate connections that I’ve had with him occurred underwater, without words, with basic, succinct gestures, in a world that is not natural for human beings but that, if you adopt it, becomes a second skin, a singular, private universe, which you share with very few people. I’m not sure I feel better down there, but I do feel at peace, better connected somehow to the outside world. Although I’m not a free diver as such, not in a competitive way, as a teenager I scuba dived and did some spearfishing, but I never trained for it, it never even occurred to me. Of course I was happy to go down as deep as I could, but I never changed my life or make everything possible to make it a goal. I still swim, especially in open water, I love long distance swimming, solitary. I cannot swim with a bunch of people or in a race, I need to be alone, or max with one person – although I never found anybody to share that experience. Is fear an attractive feeling? G.F: Anyone who is dealing with fear will tell you the same: it’s a necessary feeling to be good at whatever you’re doing. When I start a painting, I’m afraid I won’t do well, but in the same time, I’m very confident with my capacities to do well. I need to find the right balance between being cautions and bold. Fear just helps you to acknowledge both your limitations and the power of your body and mind. Free divers have to deal with these feelings. E.F: How would you paint being in the deep blue? G.F: Not sure! Although It’s what I do everyday, it’s very hard to put a sensation in image. It took me a long time to paint and draw landscapes as I never had any problem dealing with nature. I started painting figures because I guess I had to deal with myself and others in society, but alone in nature I always felt at peace and when I started to draw and paint I never felt the urge to represent it. Painting and art comes from the sensation of being alive but to be complete, the artist needs to produce things, it’s like a compensation, most of all it’s a necessity. Let’s say I think of what it feels like to be underwater, I will probably not paint a diver underwater, it just doesn’t make sense. The sensation might just come from a color, an open or closed door, it doesn’t really matter, you can paint death by painting the sun. 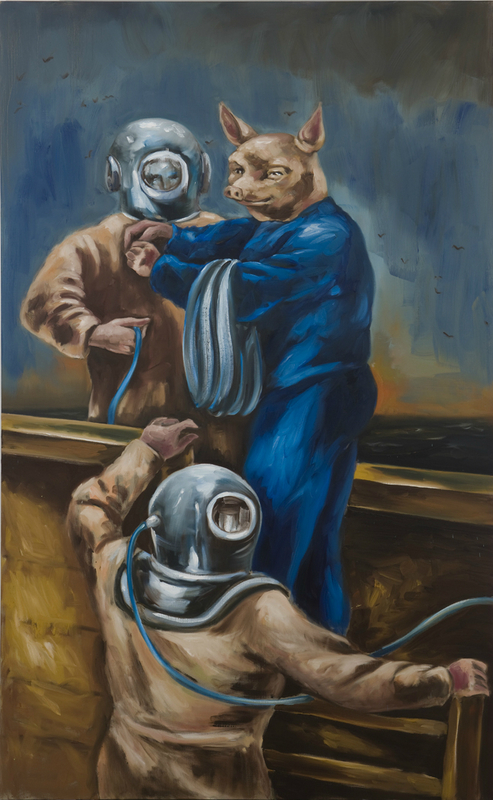 “Gregory Forstner paints like he writes, like he swims, like he loves,, like he lives : completely, without any compromise.” Is it correct? Because if so you must be very lucky..
G.F: Easy to write for a critic, not so easy to do! Luck has not much to do with it, at least regarding every day life, it’s mainly work, choices we make, etc. I try to live the life I chose. Of course I feel very lucky that I had a good starting point, food on the table and caring parents. We don’t all start with the same chances in life – in that aspect, yes I feel very lucky. E.F: Do you know why you didn’t continue as an actor? E.F: Your life is like a ballad on the planet, where do you feel home? G.F: My mother was born in Algeria, raised in Casablanca. My father was born in Austria and built his life in London, Africa, and I was born in Cameroon, etc. We just “landed” in Nice and stayed there a while. Before moving to the USA, in a naïve way, I felt a citizen of the world. After moving to New York, I did feel European. But to tell you the truth, it’s a bit a cliché, though it has some truth: after a while when you leave outside your so called “home country », you don’t belong really anywhere, anymore – but I do feel at home where ever I’m near the water. G.F: I wrote a text titled « Mon Héros” (“My Hero”/My Hero ») and it is about my Nazi Grand Father… I cannot sum it up here, you need to read it to understand the content and the irony and truth that’s in it. But I will tell you something that not everyone may like to read but I will try to explain a bit anyway, I hope it explains at least the title “Mon Héros”: I once asked one of my Austrian cousin who’s just a bit older then me if she knew a bit more about our grand father (I really don’t know much). She answered that she did make some research and found out that he was not such an important SS, Nazi, but just a regular Nazi, nothing special, just a regular officer of the “Totenkopf”. She told me that it gave her this strange feeling of disappointment, knowing he was not someone “special” or important in the SS. As a matter of fact, I felt like her, it’s a strange feeling, hard to explain. Somehow, the only relationship that a son or a grand son is looking for towards his parents, grand parents, is pride, maybe even more as a boy – I don’t know. The only possibility is pride and look for the hero within anything that is left there. And love has nothing to do with good or bad. As a kid, my grand mother always told me I looked even more like my grand father then my father. She used to say it and be proud of me when saying it by showing me the photos – I looked and thought he looked good, so I became proud too. At that time of course I had no idea of the war, what it meant to be on the good or bad side of life and death and society and politics. Basically I was proud of an abstraction. E.F: Do you believe in blood bonds? G.F: I believe that you do inherit genetics. But my grand father being a Nazi has nothing to do with genetics! It’s about context and education and what ever choices are left in front of you – not that these facts exclude any guilt or responsibility. To know the truth and work on it helps us to build ourselves, but it doesn’t make you a monster or a wonderful person because your ancestors were monsters or wonderful persons. The context is as much important, even more maybe then genetics, it’s just that life actually “happens” and you do what you think best with the frame that is given to you and the possibilities that you give yourself. E.F: How do we deal with ghosts from the past? G.F: Well, I cannot speak for others. If I take the example of my father who carries the same name as his father: he left Austria at a young age and reinvented himself in Africa. He never talked to me in german, I guess that’s a way of dealing with this specific issue with me: to not give his own mother tongue to his son – it speaks for itself, no need to be a psychiatrist. E.F: Do you believe that art in general has a therapeutic importance? G.F: To look at it this way may be a bit too literal. Of course, any kind of expression helps you deal with stuff, but only because you make something out of it, it doesn’t kill the ghosts, but you just live with them. They become part of you and you move on. E.F: How would you describe the sensation of being down there to someone that has never lived that experience? G.F:I feel very humble when I think of Enzo Maiorca and Jacques Mayol – whom I met at 11 years old, as well as the great sportsmen and women, competitive free divers out there and that I will meet in Amorgos. But to my own extent and possibilities, I do understand their sensation. A writer doesn’t have to live all the adventures of the characters in his novels to understand them, to love them. We all have different reasons to go « down deep ». It’s all in one’s head. G.F: A monograph of my work covering 15 to 20 years of my work as an artist just came out. We already did the release in Paris and Nice last month. So New York is next, then Berlin. At the moment I’m preparing solo and group shows and Art Fairs with my galleries. I also have a project to go back to Africa, but it’s very recent and I’m still figuring out how and when. And I write when I don’t paint and I swim. I very much hope to swim and go spearfishing a little while being in Amorgos! 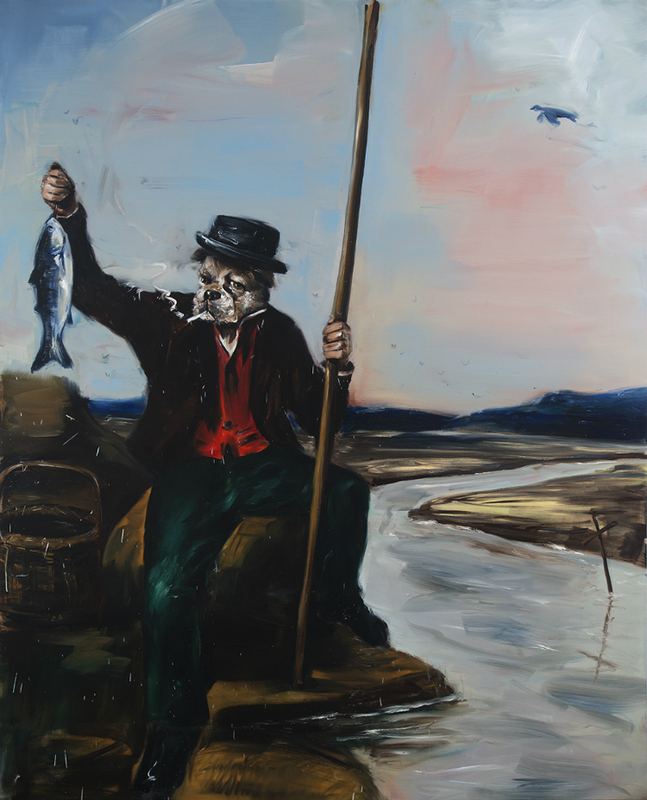 My painting explain itself on its own: My father and I offshore on that boat ready to sink at any moment, both of us wearing the German helmet. We have dog faces, he’s older and is in charge, he wears a watch, and I have a harpoon on my shoulder, lost in my own thoughts. 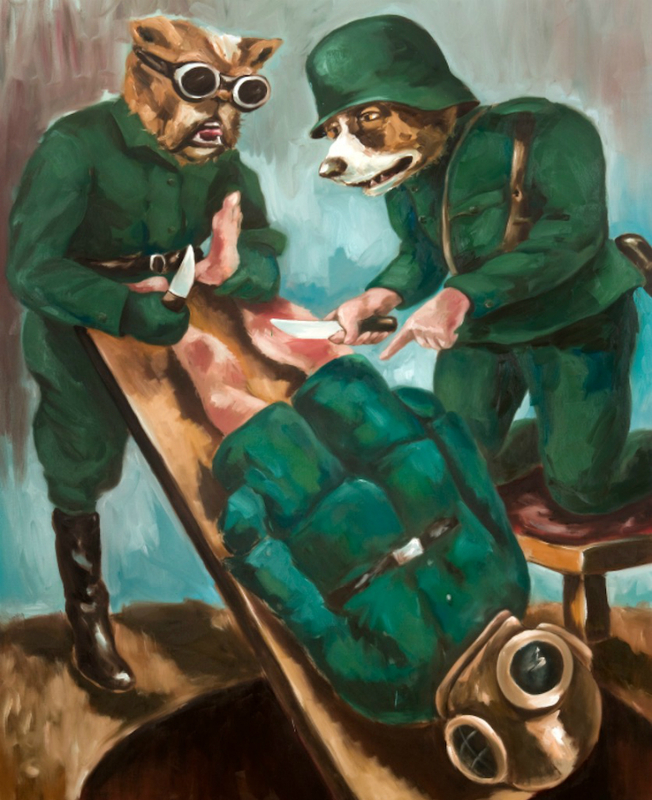 “The Depatrure” and “Waiting Room” series are part also of a very important body of work: “The Departure” shows soldiers with dog heads/masks taking care or threatening another character, possibly a diver. It can be seen as the traditional Oedipus between father and son. It was also inspired by some engraving of the 15th century. His last book is published by éditions DILECTA in Paris. Gregory Forstner is a visual artist born in 1975 in Douala, Cameroon from a French mother and an Austrian father. Often with an offbeat vision and playing with contradictions within the same image, Gregory Forstner builds strong metaphors and allegories that have the power to polarize attention durably. Since 2008, he works between the USA, Germany and France. As a teenager Gregory Forstner discovers that his grandfather on his father’s side had been a nazi and a SS and his grandmother chief of a factory mobilized in the war effort. 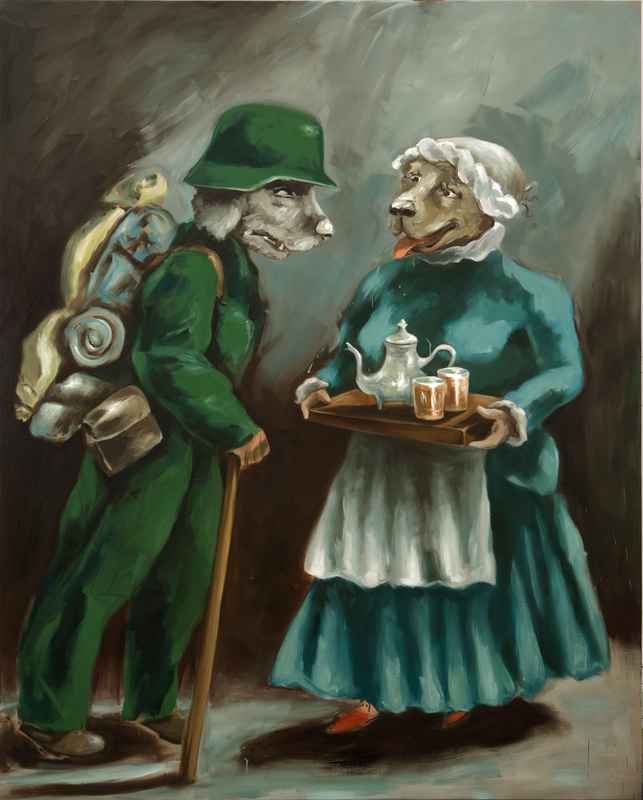 In L’odeur de la viande, Gregory Forstner writes : « The German helmet – this peculiar ornarment, further from its immidiate reference, has become in my work the hallmak’s heritage of men’s madness and his responsibility for legacy. After studying fine arts, he traveled, won art prizes and distinctions, and has shown his work in galleries around the world. He has been living in NYC the last ten years and still travels between Europe and the US for his exhibitions. His work is collected by private collectors and museums across the world. Il y a 31 ans (pour le film on est en 1968) un garçon timide de France s’apprête à plonger pour attraper une pièce dans le port d’Aegiali à Amorgos, lorsqu’un Italien de grande taille avec des lunettes de myope, une voix de basse et le regard autoritaire, plonge à sa place et dans un souffle gagne la pièce et l’admiration de tous. 20 ans plus tard (1988 sur le grand écran) le garçon revient avec la voix plus grave de Jean Reno et une nouvelle provocation pour décrocher le titre du champion mondial de plongée libre face à son ami d’enfance. Les deux plongeurs réels sont devenus, avec quelques changements, les deux héros du « Grand bleu » de Luc Besson , et le personnage d’Enzo Maiorca enfant, Molinari dans le film, a été incarné par Gregory Forstner, alors âgé de 11 ans. Moitié autrichien et français, artiste plasticien, il a également écrit un livre, citoyen du monde qui considère la mer comme étant « sa maison », Forstner revient sur les lieux et les temps de l’innocence, à l’occasion du 1er tournoi international de plongée libre à Amorgos du 18 au 24 septembre, l’île ou il a tourné Le Grand Bleu. On dit que l’eau a une mémoire. Gregory Forstner avoue ne se sentir bien que près de l’eau mais pas forcément pour se souvenir. Un plongeon dans le passé. Dans les profondeurs de l’eau, mais encore plus de la mémoire…. Il nous parle d’expériences de vie, de projets et de quelques fantômes. E.F : Retournons 30 ans en arrière, vous avez 11 ans, de quoi vous souvenez vous ? G.F : J’étais un enfant, je ne pouvais totalement comprendre ma chance, mais je me suis bien amusé et je me souviens tout de ce voyage et de cette expérience à Amorgos et Ios notamment de ma rencontre avec Luc Besson, Jean Reno, de toute l’équipe. Besson était très gentil, à 28 ans il savait ce qu’il voulait, il avait le courage de ses émotions. Il m’a facilité ce que je devais faire, je me suis senti très à l’aise avec lui, il était agréable, accessible et en même temps professionnel. J’ai écrit sur cette expérience dans mon livre « L’odeur de la viande » publié il y a 2 ans. Je ma rappelle d’Amorgos comme d’une île très simple, brute (dans le bon sens du terme), loin du tourisme. Le plus souvent nous attendions le temps propice pour tourner. C’est la première chose que j’ai appris en tant qu’acteur : la plupart du temps il faut tuer le temps. Et tuer le temps n’était pas un problème dans ce contexte. J’avais loué un Dax et je me souviens de mes virées dans toute l’île, toute la journée en liberté absolue, totalement inconscient, sans casque et en short. Le paysage était devant moi, sous moi, partout, j’avais l’impression de me promener en vélo sur la lune. E.F :Pourquoi avoir tant tardé à y revenir ? G.F : J’imagine que j’avais besoin d’une véritable raison. Je suis né au Cameroun et n’y suis jamais retourné. Pour les lieux qui comptent vraiment, surtout ceux liés à l’enfance, je suppose qu’il faut une motivation supplémentaire pour y retourner. Il fallait que cela fasse sens, que cela ne soit pas simplement anecdotique. Quand la réalité rencontre le passé il faut que cela apporte quelque chose de nouveau, de différent, qui le lie au présent, sinon on est amené à comparer aux souvenirs, ce qui est forcément compromis. Le cadre d’une nouvelle expérience est indispensable pour que ce ne soit pas décevant. E.F :Là bas, au fond, le monde est meilleur, disait Jacques Mayol dans le film. Comment est le fond à vos yeux ? G.F :Mon père m’a appris à plonger très jeune. L’un des contacts des plus fort que j’ai eu avec lui, a eu lieu sous l’eau, sans paroles, avec des gestes simples et brefs, dans un monde qui n’est pas naturel pour l’être humain, mais qui, en s’adaptant devient une seconde peau, un environnement unique, privé, qu’on partage avec très peu de personnes. Adolescent je faisais de la plongée sous marine et de la chasse en apnée mais ça ne m’a jamais traversé l’esprit de faire des entrainements. Bien sûr j’étais heureux de descendre le plus profondément possible, mais je n’ai pas changé de vie, je n’ai jamais rien fait pour que cela devienne un but dans la vie. Je nage toujours, surtout en pleine mer, j’aime la nage longues distances, seul. Je ne peux plus nager avec d’autres ou en compétition, je veux être seul, tout au plus avec une seule autre personne – bien que je n’ai jamais trouvé quelqu’un avec qui partager cette passion. E.F :Le fond c’est l’inconnu, la solitude, le calme, la peur…la peur, est-ce un sentiment séduisant ? G.F : Quiconque se confronte à la peur vous dira la même chose : c’est un sentiment indispensable pour être bon dans tout ce qu’on fait. Lorsque je commence un tableau, j’ai peur qu’il ne soit pas bon, mais en même temps j’ai une grande confiance en mes capacités. Je dois trouver le juste équilibre entre la prudence et oser. La peur aide à connaître simultanément ses limites et la force de son corps et de son esprit. Les apnéistes doivent affronter ces sensations. E.F :Comment peindriez vous le fond ? G.F :Je ne suis pas sûr. C’est très difficile de mettre une émotion en image. Ça m’a pris du temps pour peindre et dessiner des paysages, car je n’ai jamais eu de problème à affronter la nature, la nature ne m’interroge pas de la même manière que la figure. J’ai commencé à peindre la figure car j’imagine que je devais faire face moi-même et aux autres en société, mais seul dans la nature je me suis toujours senti bien, en paix, et donc lorsque j’ai commencé à peindre je n’ai pas éprouvé le besoin de la représenter. Si je pense à ce qu’est la sensation d’être sous l’eau, il est probable que je ne vais pas peindre un plongeur, ça n’a pas de sens. La sensation peut provenir d’une couleur, d’une porte ouverte ou fermée, vraiment ça n’a pas d’importance, on peut peindre la mort en peignant le soleil. G.F :Plus facile à écrire qu’à faire. Ça n’a pas grand chose à voir avec la chance, c’est surtout du travail, les choix qu’on fait, etc. J’essaie de vivre la vie que j’ai choisi. Bien sûr je me sens chanceux d’avoir eu un bon départ dans la vie, avoir à manger à table et des parents attentifs. Nous ne débutons pas tous avec les mêmes atouts dans la vie, de ce point de vue je me sens très chanceux. E.F :Savez-vous pourquoi vous n’avez continué le métier d’acteur, le cinéma ? E.F :Votre vie est comme une promenade sur la planète. Où vous sentez vous chez vous ? Ni fierté, ni culpabilité, c’est à dire de la distanciation ? G.F :J’ai écris un texte intitulé « Mon héros » à propos de mon grand-père nazi. Il faut le lire pour en comprendre l’ironie et la vérité. Mais je vais vous dire quelque chose que tout le monde ne voudrait pas lire, mais je vais essayer de vous l’expliquer, j’espère en tout cas que ça explique le titre. Un jour j’ai demandé à une cousine autrichienne un peu plus agé si elle savait quelque chose de plus sur notre grand-père (je ne sais pas grand chose), elle m’a répondu qu’elle avait en effet fait des recherches et découvert qu’il n’était pas un nazi des SS si important, rien de remarquable, il aurait été un simple officier SS des « Totenkopf ». Elle m’a dit avoir ressenti (et cela sans culpabilité) quelque déception à apprendre qu’il n’était pas quelqu’un d’important dans les SS. La vérité est que j’ai ressenti la même chose. C’est un sentiment étrange, difficile à expliquer. D’une certaine façon le seul sentiment qu’un enfant ou petit-fils recherche chez parents ou grands parents est la fierté, encore peut-être plus pour les garçons, je ne sais pas. L’amour n’a rien avoir avec le Bien et le Mal. On peut aimer un monstre, c’est comme ça. Quand j’étais petit, ma grand-mère me disait que je ressemblais davantage à mon grand-père qu’à mon père. Elle était fière de moi en me montrant les photos de mon grand-père-je pensais qu’ il avait de l’allure, alors j’étais fier. A cette époque, je n’avais aucune idée de la guerre, de ce que ça veut dire d’être du bon ou du mauvais côté de la vie, de la mort, de la société, de la politique. En vérité j’étais fier d’une abstraction. E.F :Croyez vous aux liens du sang ? G.F :Je crois que nous héritons de gènes. Mais le fait que mon grand-père soit nazi, n’a rien à voir avec les gènes. Cela dépend du contexte général de l’éducation et des choix qui se présentent, et naturellement cela n’exclue ni la culpabilité ni la responsabilité. Connaître la vérité et la travailler aide à se comprendre soi-même mais ne fait pas de toi un monstre ou une personne formidable parce que tes ancêtres étaient ceci ou cela. Le contexte est peut-être encore plus significatif que les gènes. La vie se présente et on essaie de faire au mieux avec ce cadre qui est donné et les possibilités qui en découlent. E.F :Comment fait-on face aux fantômes du passé ? G.F :Je ne peux pas parler pour les autres. Si je prends l’exemple de mon père qui porte le même nom que mon grand père, il a abandonné l’Autriche à un jeune âge pour se réinventer en Afrique. Il ne m’a jamais parlé en allemand, je suppose que c’est un moyen de faire face à ce sujet avec moi : ne pas donner sa langue maternelle à son propre fils est assez explicite, pas besoin d’être psy pour comprendre. E.F :On dit que l’Art a une fonction de thérapie, vous êtes d’accord ? G.F :Je pense que c’est un peu littéral et naïf. Bien sûr, chaque type d’expression nous aide à faire face à des préoccupations, mais simplement parce qu’on en fait quelque chose ne tue pas les fantômes. Ils deviennent une partie de soi et on avance. E.F : Comment décririez vous la sensation d’être au fond à quelqu’un qui n’en a pas fait l’expérience ? G.F :Je ne suis pas un véritable plongeur, je suis très humble en pensant à Enzo Maiorca et Jacques Mayol que j’ai connu à 11 ans, comme à tous les autres grands athlètes apnéistes que je vais rencontrer à Amorgos. Mais à ma mesure et mes capacités je comprends la sensation. Un écrivain n’a pas besoin de vivre toutes les aventures des personnages de ses livres pour les comprendre et les aimer. Chacun de nous a une raison différente pour aller en bas, au fond. Tout se passe dans la tête. E.F :Quels sont vos prochains projets ? G.F :En Octobre prochain, je présenterai à New York ma nouvelle monographie qui couvre 15-20 ans de travail. Nous avons déjà fait la présentation à Paris et à Nice le mois dernier, suit New York puis Berlin. En ce moment je prépare une exposition personnelle et des foires. Je projette aussi de retourner en Afrique mais je ne sais pas encore quand ni comment. Quand je ne peins pas j’écris et bien sûr je nage. J’espère nager et faire de la pêche sous-marine à Amorgos. Et je rêve d’acheter une maison au bord de mer/ au bord de l’Océan – j’y travaille, cela prendra du temps, c’est le projet d’une vie ! « Mon travail, en général, concerne l’absurde. Je peins car je ne comprends pas ce que je fais sur Terre. Enfant j’avais l’image d’un Dieu riant en nous regardant d’en haut. Des années après j’ai retrouvé dans le rire de Démocrite la même relation à l’absurdité. A propos de mon travail avec « les chiens casqués », il est possible que les gens s’arrêtent sur le sujet de la guerre, l’Allemagne, etc sans chercher plus loin, mais c’est le jeu, il existe toujours différentes façons d’aborder l’expérience. « La Nef des Fous est un livre du 15e siècle de Sebastian Brandt, une allégorie illustrée par Dürer puis par Bosch qui montre un bateau naviguant vers le paradis des fous, flottant sur une mer de vin. Né à Douala, Cameroun, en 1975, de mère française et de père autrichien. Choisi par Luc Besson à l’âge de 11 ans pour jouer le rôle de Enzo Molinari dans « Le Grand bleu », incarné à l’âge adulte par Jean Reno. Après des études en peinture et arts appliqués, des voyages, prix et distinctions, expositions personnelles et collectives, ces dix dernières années il vit et travaille à New York et partage son temps entre l’Amérique, la France et l’Allemagne. Ses œuvres apparaissent dans les musées et galeries un peu partout dans le monde.